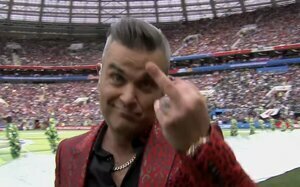 Posted in Misc and tagged Robbie Williams, World Cup 2018 at 4:07 pm on June 14, 2018 by Aaron McAllorum. Blow-ted, I’d say, going on that carry on. He’s saying I’ll wear this ugly fupping jacket if I want to and if you don’t like it you can go fupp yourself. He’s such a cool 44 year old. Didn’t know Morrissey was performing. I did this for free, he sang then flipped the bird at those who said he sold out. Well known fact that Robbie has tourettes of the hand.